When we’re approached for custom maps, it has become increasingly apparent that many people are not even aware of the existence of “GIS”, let alone what’s involved in getting out of it what you need! This page is intended to give the complete novice a basic outline of the technology, why it exists, and what’s required to make it work. Browse through at your leisure, there are plenty of illustrations when the subject matter gets a bit technical. Alternatively if you have a question about a specific aspect of GIS we’ve not covered here, you’re welcome to get in touch. What it is, from the most simple (for example a pencil on a desk), to the most complex (a large modern city or a tract of forested land). Because our lives and interactions grow ever more complex, GIS and related technology have almost “evolved” as a means of allowing us to investigate and understand the confusion. Quite simply, most (possibly all) human minds are incapable of processing the enormous amount of “information” which defines the collective social and natural environments beyond that of our own immediate experience. Having trouble knowing which GIS app to buy? There are many choices. Don’t struggle and risk spending more than you need or even ending up with a product which doesn’t do what you need, see the options on our GIS support page before you do anything else! GIS by definition is a digital technology. The fact that you can read this web site means you have access to the hardware necessary to utilise GIS technology. Skipping the historical origins and development of GIS, modern personal computers have sufficient power to effectively run even the most sophisticated of GIS software. 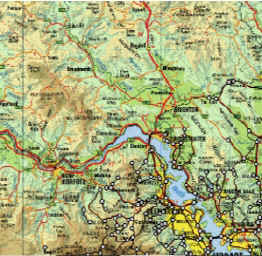 Furthermore, GIS software is capable of addressing “map” type problems from the most simple printout to the most complex exploratory data analysis. In effect there are no significant hardware or software limitations. Most restrictions reside with data, but more about this later.. Historical note. Before the wide availability of powerful PCs and GIS software, spatial problems were addressed using overlaid “tracing paper” maps and coloured crayons. Old habits die hard, even in large hi-tech businesses! A bit of patience is required at this stage. The data which is used in a GIS needs to be understood from the basis of it’s structure. There are two major types of GIS data, so we’ll look at each in turn. 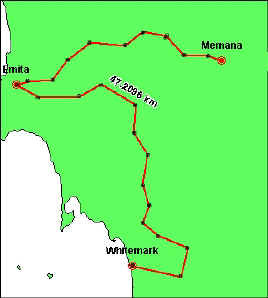 A single point occupying a precise single location in “map space”. Our example shows three town centres. Note the pairs of numbers alongside each town; these are coordinate references, more on these later, but they underpin everything we do in a GIS! A series of straight lines, joined to their immediate neighbours at the end of each section, at which point the next line segment can change direction. 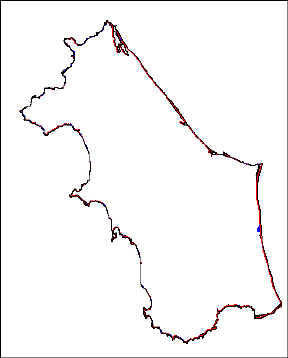 A line has both direction and length in map space. 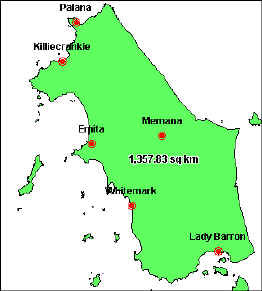 The line unit of measure is linear units, for example kilometres. These have similar components to lines, but with the crucial distinction that their end sections join each other. This give the resulting object not only length and directions, but a measure of enclosed area in map space. 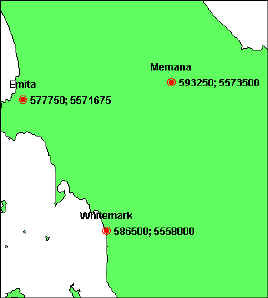 Areas can be any shape. The area unit of measure is square units, for example square kilometres. 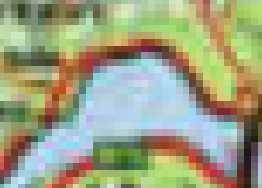 The second type is “continuous gridded“, or raster data. In this case there are two basic forms; “dumb image” raster, and “intelligent” raster. Dumb image rasters are simply computer images such as those on a web site. They’re made of rows and columns of coloured cells, or “pixels” which become clearly visible when we zoom in really close, as shown on the right: While these look like the “maps” we encounter in daily life, they are simply images. Some GIS’ allow us to show them in real world map space, but their usefulness is usually limited to providing a familiar look and feel background for our other types of data. Notice how the apparent information quality decreases as we zoom in closer – this is an artifact requiring conscious consideration during map production, particularly considering the intended end uses of the map. It is always a trade-off between maintaining clarity at higher zoom levels and rapidly increasing file size as we do so.. Intelligent rasters have a similar appearance, but an important additional characteristic; they have a number or value associated with each pixel. While the “map” to the right might look like a slightly different version of the “dumb” raster we first considered, within a GIS environment, we can click with our mouse and receive information about the real world. 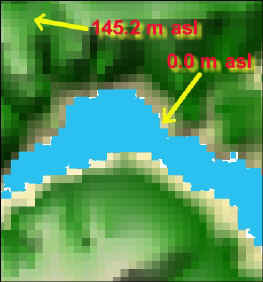 This is shown in the enlarged picture; we’ve only shown two such values (they represent height of the land surface above sea level, in metres), but each pixel has its own value. 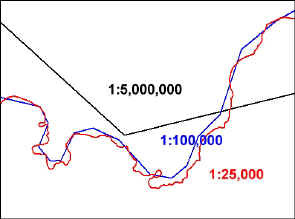 Elevation is a typical example of this type of data, because the real world feature it represents varies continuously over the earth’s surface. Another familiar example is the satellite “picture” we see on daily TV weather reports. Finally, all objects in a GIS have the capacity to be linked to data describing something about the object. These data “attributes” can be simple to complex, depending on what the data is to be used for. Anyone familiar with spreadsheet or database formats would recognise a GIS attribute table. A note of caution though; just because you’re seeing data in a GIS doesn’t always mean it’s either accurate or complete. To be able to use the results of GIS work (as with any data manipulation process) you’ll need to have a reasonable understanding of your data and its origins. If in doubt, it’s always a good idea to get a second opinion before you get too far. You’re always welcome to contact us at MapMakers for a no-obligation discussion about data quality and suitability issues. Ease or complexity of use. Ranges from fairly easy (providing you read the documentation of course!) to incomprehensibly complex. Functionality, from basic to comprehensive. Flexibility to use a range of data formats. From comprehensive and accurate, to frustratingly limited and endlessly frustrating. There is absolutely no direct relationship between how much you’re asked to pay and whether the product will meet your needs! Before making any purchase decisions, we suggest that you consider purchasing one of our GIS Software Support Policies. We have used mainstream GIS software for many years and accepted multi $,000 annual software costs as “normal”. We now primarily use what in our experience is the best engineered, most functionally comprehensive GIS application created to date, and get this, it can be purchased for well under $AU400 (unlike virtually all other GIS service providers, MapMakers Australia do not have any relationship, financial or otherwise, with any commercial GIS software vendor). This insight alone makes one of our Support Incidents ($82.50 per30 minute block) or even our Annual Support Policy worth the cost – commonly deployed GIS software will typically cost $3,000+. You don’t need to pay it, so don’t! Historically, arcane computer operating systems and command-line communications have severely restricted access to spatial technology. Not too long ago, there was constant debate in the GIS industry, concerning whether the “discreet object” vector model, or the “continuous gridded” raster model were the “best”. Common sense thankfully has prevailed, with a general acknowledgment that it’s horses for courses, and the two approaches need to be adopted in varying degrees for most purposes. Regardless, most of the mainstream GIS software products began life favouring one of the models over the other. As a result, most have maintained better development paths for their original choices… As far as functionality is concerned, most GIS software have good display and query capabilities. Data editing functions are usually present, but are variable in their ease-of-use. Analytical capabilities are more varied, although most will allow linking to external database software, where more complex analysis can be performed if required. Import and export is perhaps the most variable across the available software. Some of the longer established products have very poor or convoluted mechanisms for using data, other than that in their own proprietary formats. With the entry of new GIS products, this situation should change rapidly. GIS data formats are more complex than many document types we’re used to on a PC; usually there are several separate files used to store information about a single GIS set of objects. Managing GIS data can be very challenging, especially for certain older types of software. Seems simple enough? Well it is until we start to think about what we’re dealing with. Let’s look at an example. Start by imagining a typical paper map. It is most likely quite large, say 1 metre by 0.7 metres. The same size paper map can be used to show anything from a map of the entire world, to the floor plan of a house. The size of the map is the same, the scale of what is shown is different. The map of the world shows a very large area, however the scale it is shown at must be very small in order to fit the entire world on – say 1 unit of measure on the paper represents 20,000,000 units of measure in the real world. This is said to be a small scale map. The map of the house plan shows a very small part of world, so the scale on the map is very large – say 1 unit of measure on the paper represents 50 units of measure in the real world. This is said to be a large scale map. In GIS, we can seamlessly use map data of any variation in scale. However it is important to consider that if we do combine different data captured at different scales, we can scale down from large scale to small scale, but we can’t go the other way. Using the extreme example above, we could combine millions of house plans and come up with a map of the world (it would look a bit strange, but it would be recognisable as a map of the world nevertheless). But, no matter how hard we tried, we couldn’t take our 1:20,000,000 scale world map data and have any hope of zooming in to see even the biggest home! For static maps (either paper or digital) the size of the page we fit our maps on to is important. Small pages are suitable only for maps showing very small areas of the world at large scale, or larger areas of the world at small scale. At this scale we can see clearly how representation of the same feature changes with different scales of data. If we wanted to have a detailed look at this island for example, we could probably use the 1:100,000 data, almost certainly the 1:25,000 data, but not the 1:5,000,000 data. Historically, most maps have been prepared by government agencies. There are several reasons for this; land division and administration including the raising of taxes, to promote and facilitate exploration and economic development, and for military planning purposes. While we are used to paying only a few dollars for a paper map from a government agency, the actual cost of producing maps is enormous, and only governments have the revenue base to undertake the tasks. 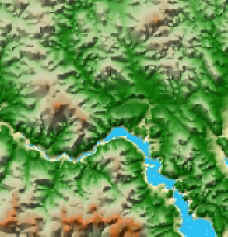 With the advent of GIS, (essentially since the early 1980’s) existing maps have been converted into computer based digital format, and new maps are created using GIS. Governments have been the largest single user of GIS technology for this reason. Most maps available as paper products are now available in digital form. Increasingly, private sector organisations are creating map data in GIS form (like ourselves), however the high costs involved will mean governments remain the primary source of GIS data. Background / context imagery including satellite and aerial images and street level “map images” from open sources are increasingly available. Many GIS applications have the capacity to access such data – there are several such examples elsewhwere on our site. Digital data costs and government policies. As indicated, we are used to paying only a few dollars for a map. It comes as a surprise (quite often a horrified shock!) to many new GIS users to learn that the GIS equivalent to the ten dollar map can cost many hundreds of dollars! Until the early 1990’s, GIS software required expensive computers in order to function. Only large companies and government agencies had the capital to afford GIS. Government mapping agencies knew this and priced digital data according to the perceived “ability” of potential buyers to pay; in other words it got stuck with a big dollar ticket! Regardless of what we may think of Bill Gates’ empire, we have Microsoft to thank for making high powered computers available and affordable for the masses. GIS is now available to everyone. As a result, many (and we hope eventually all) governments are reviewing their prices downwards. In reality, the tax payers of the world already have paid for all government generated GIS data, and it is our strong belief at MapMakers Australia that all government spatial data should be made freely available at no cost through Internet via download. The USA leads the world in its generally open and cost-free policies on spatial data access. However for those with interests outside the USA, we will have to put up with government data charges for some time yet. We suggest you lobby your federal and state members for access to the data you’ve already paid for. This is a light-hearted look at some of the common, confusing, and often problematic assumptions newcomers to using GIS encounter. I’ve bought the GIS software, so I’m ready to map the world! Not really! In your GIS package will be a DVD or CD, and maybe an instruction manual (though the trend increasingly is to make software and documentation available via download). That’s it. Now you need to learn about coordinates, projections, new types of data on your PC, AND get some data into your system which is relevant to the problems you wish to address in getting to this stage. You may want to have a look at the topic on our GIS software support page if getting up-and-running is your main objective. You may well be prepared for this as an individual, however if you’re working in an organisation new to the technology, your “bean counting” department will think, having written out a (possibly sizeable) cheque, the organisation is now in the GIS league! Reality is the up-front purchase of the software is a small initial investment. The real value, and also cost of an effective GIS is populating it with the data required. My new software was selected as being a “total solution” product, so I won’t need to budget for anything else in the future. If you’re lucky, and you fully scoped your needs before deciding. Often though the base GIS product will require additional “bolt-on” components to give it a more comprehensive functionality. The degree to which this may be true is highly variable, but some “optional extras” can cost as much or more than the core GIS software itself. Technology shows no sign of slowing down. Software companies constantly modify their products to take advantage of hardware and operating system advances. For most GIS software there will a “new” version every 1 to 2 years. To stay up-to-date, you may need to consider budgeting for a periodic “upgrade cost”. While not as expensive as a new copy of your GIS software, upgrade costs are usually in the vicinity of 40-60% the cost of a whole new copy! Don’t even consider buying into that old game! With the arrival of high tech and affordable GIS software this pattern has changed. Real functional updates are more frequent than has been the case with legacy GIS vendors such as ESRI or MapInfo, and are available at little or no additional cost. Consider buying one of our Support Policies and share the insights (and huge dollar savings) MapMakers have been enjoying! We have a CAD department, and they do maps, so we don’t need a GIS. In many cases this is true, but if the organisation deals with neighbours, or has assets located in the real world, it is likely that some form of GIS will be needed. CAD “drawings” normally are “lost in space”. While their components are correctly located relative to each other, they usually don’t possess real world coordinates. While they can be registered to real world coordinates for export and subsequent use in a GIS, capacity to analyse in a CAD environment usually doesn’t exist. I’m an individual, or a small business – I can’t possibly justify the up front cost of GIS software. Until quite recently you’d have probably been right. Today there are some exceptionally capable products available at very competitive prices. Do yourself a favour and buy a Support Policy. We undertake most of our work using class leading GIS, unparalleled in specification and performance and available for under US$300. Often people ask us “..how can it be any good if it is so cheap?” The answer is simply that many major GIS software applications are grossly overpriced, typically charging several thousand dollars for their products. A lot of that is to pay for expensive CBD offices and sales representatives with briefcases full of promises. It is nice to be able to say for once, that you don’t necessarily get what you pay for! My government land agency or businesses I deal with, use a particular GIS product, so I feel I need to use the same so that I can use the data they supply and use. Not at all. Governments and professional businesses should be able to supply and utilise data in all of the most common formats. If they tell you they can’t or don’t, they’re being lazy! The days of spatial data being locked up in proprietary formats are for most of us, just a fading bad memory.